Art Deco in the Tropics - Innisfail Inc. In 2002 Peter Kenyon, a social capitalist and community enthusiast, was invited to Innisfail to facilitate fresh and creative ways which residence could stimulate the community and encourage econimic renewal. It was from this workshop that a group of like minded locals, aware and appreciative of Innisfail's beautiful architecture, formed an Art Deco society. "Art Deco & Modernism Society" Melbourne, was asked for advice and the best way to officially establish the new Art Deco Society. From Mr Grow's advice and help "Art Deco in the Tropics - Innisfail Inc." was created as a not-for-profit organisation, with Gerry Raudzens the first president being voted into office. Under the lead of Gerry Raudzens and with the help of a strong group of enthusiastic members, the Art Deco society set out to promote and educated the town of its unique architecture, while showing the town its potential value within its buildings. Even though this task sometimes seemed to be an uphill battle, this initial team was successful. Business and landlords now take pride in their buildings, stylising, repainting, preserving the historic character of facades. Cassowary Coast Regional Council even encourages new developement to be more sensitive towards the town's established Art Deco heritage, putting effort towards the design of their buildings in oder to preserve this unique theme. Tourists travel in droves to be part of the atomosphere that is Art Deco, Innisfail. Art Deco in the Tropics - Innisfail promotes the conservation of the Cultural Heritage of Innisfail and its surrounding district. The diversity of our multi-cultural community and its influence upon our Art Deco street scape is celebrated. Art Deco in the Tropics aims to educate our visitors about the beauty of Art Deco. 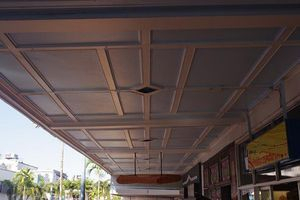 To achieve this, we follow the same six principles developed by the pioneering members of "Art Deco in the Tropics - Innisfail"
Use education and promotional events to build community awareness and understanding of the Art Deco style. Encourage sympathetic designs in new developments in order to compliment the town's current Art Deco designs. regarding the different design and historical aspects of Art Deco. 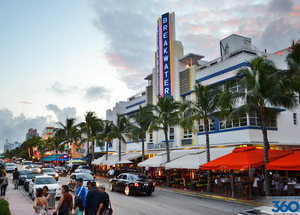 Work closely with local businesses to increase their awereness to the economic benefits of Art Deco tourism. Build and maintain strong relationships with other Art Deco Societies with-in Australia and internationally.